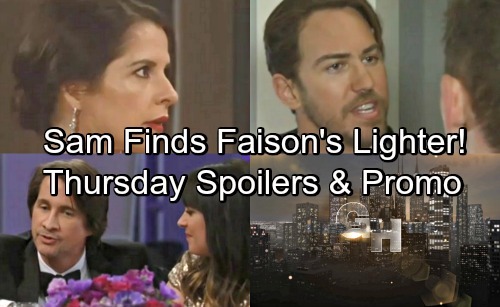 General Hospital (GH) spoilers for Thursday, May 17, tease that Sam (Kelly Monaco) will dig around Peter’s (Wes Ramsey) office. This is the prime opportunity since Peter’s busy at the Nurses Ball with Maxie (Kirsten Storms). Sam will do some investigating and stumble across something significant. A little clue will lead to a huge break in the case! Sam will find Faison’s (Anders Hove) lighter, so that should help her make a connection. She’ll fill Jason (Steve Burton) and Spinelli (Bradford Anderson) in on this new evidence ASAP. Meanwhile, Peter will remain oblivious to the latest development. He’ll focus on Anna (Finola Hughes) as his biggest threat. During another fight with Valentin (James Patrick Stuart), Peter will vow to deal with Anna himself. He’ll stomp off as Valentin glares, but this isn’t over. If Peter intends to take deadly action, Valentin just might kill him first. There’s no way he’ll let Peter get away with murdering Anna. Other General Hospital spoilers say Julian (William deVry) will greet Kim (Tamara Braun). He’ll declare that she looks spectacular and they’ll join the others in the ballroom. 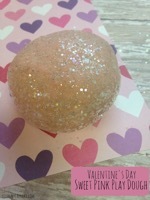 An exciting night’s ahead for all the partygoers! Curtis (Donnell Turner) plans on proposing during the festivities, but he’ll battle his nerves. Stella’s (Vernee Watson) presence will leave him rattled, but he’ll pop the question anyway. Elsewhere, Jordan (Vinessa Antoine) will seem perplexed when Chase (Josh Swickard) talks about spoiling the surprise. Of course, this is probably about the Nurses Ball number. Thanks to Dante (Dominic Zamprogna), Chase still believes a bunch of the guys are performing together. He’ll feel like a fool once Dante’s trick is revealed, but he’ll manage to put on a fabulous show anyway. Back with Anna, she’ll have a chat with Finn (Michael Easton) and Robin (Kimberly McCullough). Finn will ask if Anna will be entertaining them this evening, but she’ll insist she’s sitting this one out. Later, Finn will take Anna aside and open up about his feelings for her. That’d be great news if Alexis (Nancy Lee Grahn) wasn’t going to be lurking nearby! GH fans can expect this to be a major blow for Alexis. She’ll realize she cared about Finn far more than she thought. Of course, we should talk about Robert (Tristan Rogers) as well. There are no official General Hospital spoilers for him on Thursday, but let’s hope we see him onscreen anyway. Robert just had a heart attack in captivity! Will someone come to his rescue pretty soon? It sounds like another fantastic episode’s ahead. We’ll give you updates as other GH details emerge. Stay tuned to the ABC soap and don’t forget to check CDL often for the latest General Hospital spoilers, updates and news.